Elijah being taken to heaven in a flaming chariot. As many of you know, this is my last weekend as pastor of St. Pius X Parish. At this time next week, Fr. Mike Najim will officially be your fearless leader, and I will be officially retired from my administrative duties. It’s been a blessing and a privilege to have been your pastor for the last 17 years, and to be here at St. Pius for the last 27 years (almost 28!). And now I get to spend some retirement years here as well—which means I’m triply blessed! It always amazes me (although it shouldn’t), on those occasions when I need to speak about a certain subject in a homily on a particular weekend, and the readings tie in with that subject matter almost perfectly. As if God knew—which, of course, he did! For example, take a look at that first reading from 1 Kings 19. Here we have Elijah, the great prophet of Israel who lived in the 9th century, BC, being instructed by God to appoint Elisha as his successor. 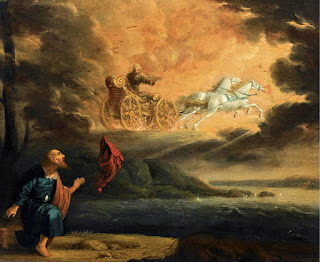 Not long after this Elijah was taken up into heaven, miraculously, in a flaming chariot, and Elisha took over. Well something very similar will happen here in the next few days—on July 1st to be exact—when Fr. Najim becomes the 7th pastor of St. Pius X Parish (although I do not expect to be swept up to heaven in a flaming chariot anytime soon!). Now the great thing about Elisha was this: He built on the prophetic foundation that Elijah had left him. He didn’t undermine what Elijah had done. He continued Elijah’s work, calling the people of Israel—and their leaders—to reject idolatry and to love and serve the one, true God—the God who had freed them from slavery in Egypt and had given them the Promised Land for their home. From my many conversations with Fr. Najim in the last few weeks, I know he has a similar attitude. 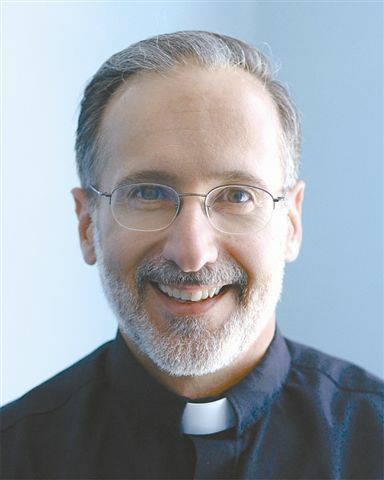 He has a tremendous appreciation for the great things that have happened here at St. Pius in recent decades (which is not surprising, since he was part of it all as an altar boy and as a member of our youth group in the 1990s), and his intention is to build on the solid spiritual foundation that we have here. In fact, that’s the expression he’s often used: “I want to build on the foundation that’s already in place”. Thus I don’t think it was a coincidence that today’s second reading was focused on the Holy Spirit. St. Paul talks there about living in the Spirit, being guided by the Spirit, and serving others in the power of the Spirit. I pray that Fr. Najim will do all those things, and that he will help the rest of us to follow his good example. These people have forgotten something. Yes, I’ve been the pastor now for 17 years, but for the 10 years prior to that I was not the one in charge. I served as the assistant pastor here from 1988-1998 under Fr. Besse first and then later under Fr. Larry. So I’ve had a lot of practice living and working and serving at St. Pius while someone else was in charge of the administration. I don’t think it will be all that difficult to assume that type of secondary role again. The blessing of this for me is that I will now have the opportunity to do my priestly work 100% of the time (or at least as much as my health—which is still pretty good—permits). I will no longer have to worry about things like leaky roofs, capital campaigns, dealing with contractors and signing checks (except my own, of course!). And that’s a “win” for me. But it’s also a win for you because there will now be two priests here to minister to your spiritual needs. And it’s certainly a win for Fr. Najim, since he gets to serve as pastor for the first time in a town—and in a parish—that he loves. And so, to use the image found at the end of today’s gospel, we all now must “put our hands to the plow” and move forward with the Lord to receive all the blessings he has in store for us. That having been said, I look forward to “burning out” with all of you in the future—even if I never take a trip to heaven in a flaming chariot. It was very appropriate—as well as providential—that Simon Peter was the apostle mentioned in our gospel reading today. Peter was, as we all know, the very first pope. The word “pope” comes from the Greek word for father—“pappas”—and today we celebrate Father’s Day. Every priest is a father (spiritually speaking, of course), and the pope—the successor of St. Peter—is what you might call the “father of all fathers”. That is to say, he’s the earthly spiritual father of the universal family of God known as “the Church,” which includes both clergy and laity. So today, on this Father’s Day we look to the original “father of all fathers”—St. Peter himself—for some important and challenging lessons on fatherhood. These are lessons, by the way, that apply both to natural fathers and to spiritual fathers. Now some of the other apostles might have believed the same thing, or at least they might have suspected that Jesus was the Christ—the Messiah—the anointed one of God—but only Peter actually had the courage and the conviction to say it. He led the way for the others. He was a good father—a good spiritual father—at least at that moment. But he wasn’t a perfect dad—which brings us to the second lesson we learn from him: Every earthly dad is imperfect. Every earthly father is a sinner in need of God’s mercy and forgiveness. The fact is, even the best earthly fathers will fail from time to time. But when the best do fall, they don’t stay fallen for very long. With a humble and contrite heart they repent, seek forgiveness, and persevere in their vocation. This was not the first time Peter had failed in his spiritual fatherhood—nor would it be the last time. And yet, he never left the Lord! He always persevered. You see this consistently in the gospels: every time Peter fell, he repented, he got up, and he moved forward with Jesus. That’s what every good Christian father does. Our first pope, as most of us know, died a martyr’s death. He was crucified—upside down—by the emperor Nero, probably near the obelisk that now stands in St. Peter’s Square in Rome. His bones are entombed below the main altar in St. Peter’s Basilica. This laying down of one’s life does not mean only the willingness to make the “supreme sacrifice” for another, but the willingness to die to oneself so that the other may more fully live. In marriage preparation, I often ask would-be grooms whether they love their fiancée enough to take a bullet for her. Never has one said no. Then I ask whether his answer would be the same if the “bullet” took one of the following forms: being abstinent before marriage; giving up smoking if she asks; being on time if he is habitually late; cleaning up after himself better; patiently telling her what happened that day at work if she requests it; learning the faith better to help pass it on to her more completely; or making the time and the priority to pray with her. Those are the types of grenades on which many men refuse to dive! But these gifts of oneself are so much more valuable than almost any material gift one could give, and they are a far greater sign of real love than any ring could symbolize. A lot of what Fr. Landry says there applies to men in their relationships with their children just as much as it applies to men in their relationships with their wives. Laying down one’s life in “ordinary” ways like these is what good fathers do for their sons and daughters—and wives. St. Peter, father of all fathers, pray for us fathers on this Father’s Day. Pray that we will be like you in the exercise of this great and precious gift that God has given to us. Pray that we will be faith-filled, humble, self-sacrificing leaders of those whom the Lord has seen fit to place in our care. And may our leadership of our children someday bring us—and them—to the house of our eternal Father, who lives and reigns forever and ever. Amen. My homily today is entitled, “The Power of a Forgiven Sinner.” Here I’m using the word “power” in a positive sense. Normally, of course. when people use the words “power” and “sin” in the same sentence, they do it in order to say something negative about power: “His sin was rooted in his desire for more power”; “He misused his power and committed a sin against his neighbor.” But when I speak here of the power of a forgiven sinner, I’m using the word in its positive sense: as the power to do good; as the power to have a positive influence on other people; as the power to bring good out of evil. That’s the kind of power a sinner has—if (and when) he or she repents! 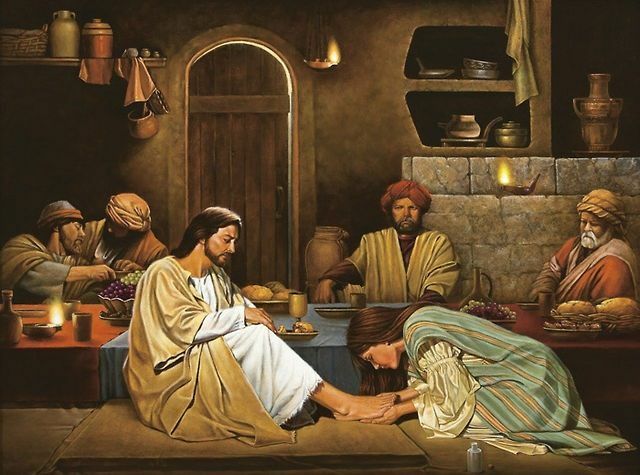 In today’s gospel, for example, a sinful woman crashes a dinner party at Simon the Pharisee’s house, and honors Jesus through her acts of repentance: she kisses his feet, washes them with her tears, dries them with her hair, and anoints them with ointment. That’s the power of a forgiven sinner. You can depend on this as worthy of full acceptance: that Christ Jesus came into the world to save sinners. Of these I myself am the worst. But on that very account I was dealt with mercifully, so that in me, as an extreme case, Jesus Christ might display all his patience, and that I might become an example to those who would later have faith in him and gain everlasting life. Paul was not happy that he had sinned so grievously as a young Pharisee by persecuting Jesus and the Church. But Paul also understood that because he had sincerely repented of those sins and been forgiven by Jesus, he now had a certain power in his life: the power to be an example of conversion “to those who would later have faith in [Christ]”. In other words, to all of us. The power of a forgiven sinner. I said, “That’s a good idea. I’ll do that when the Holy Spirit gives me the right set of readings to make the point. Well, the Spirit has certainly done that this weekend. I’ve already mentioned the gospel and second reading, but even the first reading points us to the mercy of God—the forgiving grace of God which is available to even the worst of sinners. In this reading the prophet Nathan confronts King David about two serious sins that he had recently committed and had, up to that point, ignored: adultery and murder. Most of us know the story. David had committed adultery with a woman named Bathsheba, and in the process she had become pregnant with his child. Instead of admitting his sin and turning away from it (which is what he should have done! ), David tried to manipulate the situation to make it appear that Uriah, Bathsheba’s husband, was actually the father of the child. Then, when his little plot failed, David decided to get rid of the problem by getting rid of Uriah, and so he arranged to have Uriah killed in battle. In effect, that made David guilty of both adultery and murder—a fact that Nathan makes clear to him in today’s first reading. If you have had an abortion, and have received the Lord’s forgiveness for that sin in the sacrament of Reconciliation, then the good news is that you now have a similar power in your life—a power that God wants you to use for good. It’s a power that I don’t have; it’s a power that the pope doesn’t have. You have the power to speak to other women from experience—to other women who are being tempted to make the same mistake that you made. You can warn them and influence them in a way that I can’t. You can tell them there’s a better choice they can make—and chances are, they’ll listen to you, because of what you’ve been through. And hopefully, in the process, you will help to save a life—or two, or three, or more! I would now like to say a special word to women who have had an abortion. The Church is aware of the many factors which may have influenced your decision, and she does not doubt that in many cases it was a painful and even shattering decision. The wound in your heart may not yet have healed. Certainly what happened was and remains terribly wrong. But do not give in to discouragement and do not lose hope. Try rather to understand what happened and face it honestly. If you have not already done so, give yourselves over with humility and trust to repentance. The Father of mercies is ready to give you his forgiveness and his peace in the Sacrament of Reconciliation. To the same Father and His mercy you can with sure hope entrust your child. With the friendly and expert help and advice of other people, and as a result of your own painful experience, you can be among the most eloquent defenders of everyone’s right to life. Through your commitment to life, whether by accepting the birth of other children or by welcoming and caring for those most in need of someone to be close to them, you will become promoters of a new way of looking at human life. “The power of a forgiven sinner” is a power that God wants all of us to have—and it’s a power that God wants all of us to USE, regardless of what our sins are. Like King David, St. Paul and the woman in today’s gospel story, may each and every one of us give God what he wants.